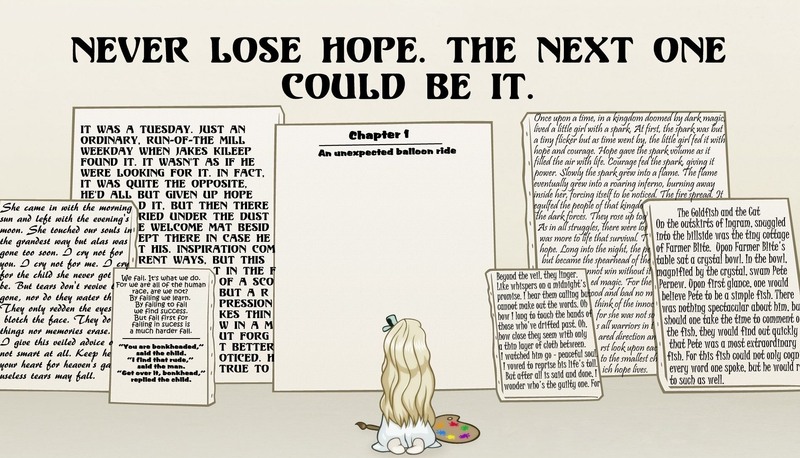 Even through all the rejections and trials, there’s still a glimmer of hope. That’s what I find keeps me going…keeps me writing. There are days that still get me down. Those are the days I think about giving up. I lived without writing before. I’m sure I could live without it again. Then, I’m drawn back to the typewriter with a new idea or a way to improve an old one. I can’t give this up. What if the next one is The One. This entry was posted in Insperation, Insperational Quotes, J. Rae Moore Original, Picture Play, Writers are, Writing and tagged Fantasy Story, Insperation, Insperational Quotes, Picture Play, Writer Insperation, Writing. Bookmark the permalink. 2 Responses to Never lose hope. Hi, J. Rae. Sometimes I feel like giving up, too. But, then something happens that keeps me going. Congratulations on your winning first place! This past summer I got first place in the children’s division of the WV Writer’s Contest with my MG manuscript, Duck and Cover. It was a while before I stopped smiling. Congratulations, Janet on your success. Also, it is good to know there are other authors out there who feel like I do at times. May your future be blessed with more ups than downs, and keep smiling.